12-year-old Hajime lives in the typical middle class suburbs of a typical post-war Japanese town, in a typical family among other, typical Japanese families. However, in a world where everybody seems to have brothers and sisters, he is an only child. In elementary school, the only friend he has is Shimamoto, new in town, whose father’s job requires her family to move frequently. Soon, the two develop a special bond, based on the fact that both are only children; but despite their attachment they lose touch when Hajime’s family moves. 25 years later, Hajime is a successful businessman in Tokyo, who loves his wife and adores his two daughters. But then, on a rainy night, Shimamoto appears in his Jazz bar, strikingly beautiful, rich, and surrounded by a mysterious air. The two rekindle their friendship, almost as had there been no interruption, and finally, Shimamoto tells him “You take either all of me or nothing”, and Hajime has to choose between his soul mate and the life he got so used to. The story follows Hajime – whose name means “beginning” – through many of the beginnings in his life, but his love for Shimamoto is ever-present. In the preface of the book, it was mentioned that Haruki Murakami owned a Jazz bar in Tokyo at some time before he became a famous writer, and I cannot help wondering how much of his own life we can read in this book. 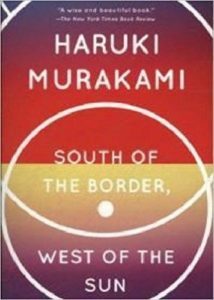 Haruki Murakami is probably the best known contemporary Japanese author. His first novel appeared in 1979, and “Norwegian Wood”, published in 1987, lead to international recognition and fame. He has also written several non-fiction books, for example “Underground” on the Tokyo gas attacks or “What I talk about when I talk about running” about his experiences as a marathon runner. A book about love and middle age, and the choices we need to make. Available from amazon.